We present below description of global trends in fenestration industry. As an example we present also an analysis of fenestration industry in concrete country – in this example it is Poland. We encourage you also to get familiar with our offer prepared specially for clients from fenestration industry. Industry analysis of main trends in fenestration industry. Industry analysis of global trends in the fenestration industry in Poland. Introduce us your company and needs and we will adapt to you our services of export consulting, market research and finding clients, taking into account special requirements of apparel industry. All regions in the world, except Western Europe and North America, in 2010 recorded an increase of construction spending. The biggest values recorded Asia and Latin America. 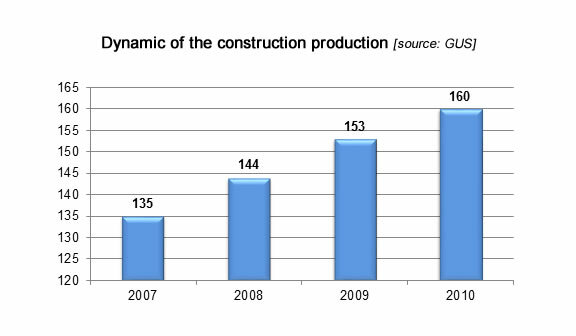 China was the biggest construction market – both in 2011 and 2012 there were the biggest construction spending. Next places occupied USA, Japan and Germany. Among the biggest construction markets, only China presents developing tendency – furthermore it develops the fastest in the world. It is worth to mention about India and Brazil, which increased their expenditures on construction, respectively of 8% and 6%. As it was mentioned in Western Europe and in North America we record stagnation with signs of even negative growth. Fenestration industry is strictly connected with the condition of construction market. In last few years in Poland, despite the global economic slowdown, dynamic of the construction production was still positive. Sales of fenestration products depend on the individual demand, developer investments, public orders and export of construction and repair services. For the last few years individual demand has remained on the plateau of 70 to 80 thousand sold apartments. The number of developer apartments sold in 2012 amounted to 63 thousand (increase by 29,4% – base level 2011). Number of permission licenses for new investments increases steadily, which is a sign of good perspectives in construction industry. New apartments are financed mainly from individual investors. Their share in total real estate investments accounts for 70,1%. Individual investors in 2010 built 10,5% more apartments than in 2011 and 7,4% more buildings. Factors which discourage to buy apartments from developers are: low level of consumer trust, financial problems of the companies and high risk of analyzed investments. Mortgage loans are also hard to get for people who earn not a lot of money. Construction products and assortment have huge impact on real estate situation. From 2009 to 2011 prices had increased by 5,1% and till the half of 2011 by 0,2%. Apartment spending increase significantly because of the price increase; the level of inflation reduces the purchasing power of buyers and causes the increase of operational costs of companies and increase of investment costs. The fenestration market is one of the fastest growing sector of Polish economy. This trend has been visible since the accession to the European Union and thanks to free trade with no barriers with not saturated Western European countries. Export is one of the main source of development of this industry. Polish window market is exceptionally fragmented. We can identify about 2 thousand of producers – no one has bigger market share than few percent. In 2010 companies with the biggest market share were: Fakro, NB Polska (ceiling windows), Drutex and Dobroplast (PVC windows). According to experts from ‘Centrum Analiz Branżowych’ we can except market consolidation due to smaller revenues of smaller market players. According to “Puls Biznesu” newspaper, Poland has manufactured in 2010 about 20 million windows and doors worth 9,2 billion USD. Due to anaemic economic growth in last few years and market saturation, companies try to diversify their operations and try to find promising business solutions abroad. 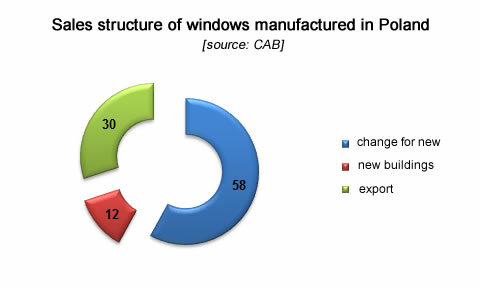 CAB estimates that 58% of manufactured in 2010 in Poland windows were used to replace old ones (including 51% in real estate constructions), 12% were used in new constructions and about 30% were exported. As regards amount of manufactured windows, Polish companies are only behind Germany, Great Britain and France; if we include also doors Poland is beaten also by Italy and Spain. Poland is currently one of the biggest exporters of PVC and wooden windows and one of the biggest ceiling windows producer and seller. Competitive labor costs and complex technology used in production process are the main advantages of Polish window manufactures. There is also government program which supports polish export of windows – for this purpose Poland will spent tens of millions dollars in coming years. 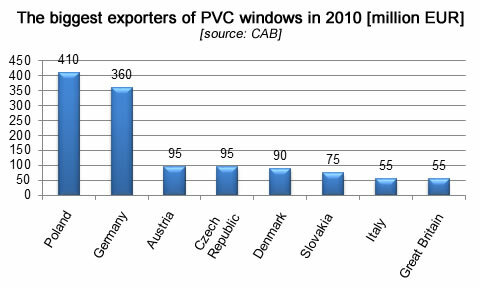 According to CAB, based on Eurostat, CAAC and GUS, from 2004 to 2011 the value of polish fenestration export had almost tripled – from 315 to 890 million EUR, while export of PVC windows had increased 6,5 times (from 65 to 425 million EUR). Following graph illustrates the value of Polish fenestration export between 2004 and 2010. 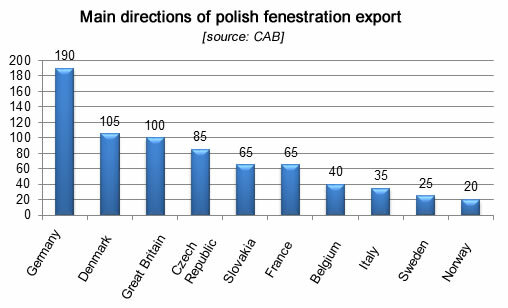 The main directions of Polish fenestration export is Western Europe, mainly Germany, Denmark and United Kingdom. According to VFF (Vereinigte Füllkörper-Fabriken GmbH & Co. KG), European windows market, after drop of 22,4% in 2009, stabilized in 2010 (the increase was minimal – 0,4%, to 125,8 million sold items, which meant an increase by 1,69 million items per year). Among European countries only Germany and Poland recorded an improvement of windows market; Poland remains the only country which has recorded steady growth since 2008. In short term, also in Poland, one of the main factor which will stimulate the growth in the windows market will be the process of thermomodernization of real estates and public buildings (it was successful in Germany). To support these activities there are introduced government programs which support energy savings in Germany, France and many other European countries. In Poland, similar like in Russia and Turkey, PCV windows account for 70% of total sale. In Europe this trend is a little bit stopped – in 2009 the share of PCV windows in total sale was still high – 56%, but it meant a fall of 2 percentage points. Due to the popularization of passive windows (energy saving), which was caused by the tendency to save energy, because of the economic slowdown and worse labor situation, their share in total sale should increase significantly in middle term. The biggest competition for PCV windows will be items made by alternative materials, including wooden and steel profiles. Plastic frames dominate in Western, Central and Eastern Europe, while Scandinavian prefer wooden products.